Entanglement is consequently the indispensable resource for relevant Quantum Computation and the viability of such Quantum Computation rests on whether this predicted phenomenon does indeed exist in the real world. It happens that a terrible mistake has been made in the interpretation of experimental Bell tests (experiments which aim to demonstrate Entanglement): The inequalities used to interpret the experiments’ results did not adequately take into account the non-idealities present in the real experimental setups, and hence, the wrong inequalities were used and the wrong conclusion, that Entanglement had been observed, was drawn. In fact, when the correct inequalities are used to interpret them, all experimental results to this date are found compatible with local-realism and, hence, no evidence presently exists that Entanglement is a real phenomenon. (2) The broader point is that quantum mechanics is a wildly-successful framework that, if it’s wrong at all, has to be replaced by something radically different. Yes, it’s important that physicists continue to perform better and better experimental tests of whatever aspects of QM they can, looking for deviations between theory and experiment. But ultimately, I’d say the burden lies with the people who deny some aspect of QM — whether it’s quantum computing, or something even more basic like 2-particle entanglement — to suggest an alternative picture of reality that recovers QM’s century of experimental successes, but in which the aspect in question doesn’t appear. Indeed, that was precisely the point of my bet: that I’m tired of the “defense attorneys” who think they win if they can raise a single point that the prosecution can’t immediately answer, and who don’t acknowledge any need to offer their own alternative picture of the world. And yet none of this is ever observed on a macroscopic level. The closest is that the Bell test experiments are given as evidence for nonlocality, but they have loopholes, and there is no convincing demonstration of nonlocality. I am one of the “defense attorneys” that Aaronson is tired of. I cannot prove that quantum computing is impossible any more than I can prove that perpetual motion machines, psychic telekinesis, and backwards time travel is impossible. I reject those ideas because they are contrary to common sense, contrary to established science, and because a lot of smart people have spent a lot of time and money on them and failed. Extraordinary claims require extraordinary evidence. The math of QM involves idealizations that are not meant to be taken literally. Eg, an electron is sometimes a particle and sometimes a wave, according to complementarity. But a particle is not a wave and a wave is not a particle. If you take either the particle model or wave model too literally, you will get some false conclusions. These are just conceptual tricks. The observations are what is real, and QM predicts those well. The quantum computing enthusiasts cite the wild success of QM experiments, but those experiments do not really justify quantum computing. For that, they resort to extrapolations of those mathematical idealizations that have never been confirmed. But none of those idealizations are real. They are just mathematical shortcuts for explaining observations. There are experiments that claim dozens of qubits, but there is a Nobel Prize waiting for anyone who can convincingly demonstrate a single qubit. Aaronson asks what would convince me. All it takes is an experiment that demonstrates a computation that is greater than what is possible with a Turing machine. I don't see much chance of that. But let’s forget about money for now. Over the past few months, I’ve had a real insight: the most exciting potential application of scalable quantum computers is neither breaking RSA, nor simulating quantum physics, nor Grover’s algorithm, nor adiabatic optimization. Instead, it’s watching the people who said it was impossible try to explain themselves. That prospect, alone, would more than justify a Manhattan-project-scale investment in this field. Aaronson is saying that he cannot prove that quantum computing has any validity, but he will settle for trying to show that there are flaws in Christian's argument that quantum computing is impossible. Christian's mathematical models probably are wrong. But Christian being wrong does not make quantum computing possible. Only an experiment can prove quantum computing possible, and no one has been able to do that. Update: Lumo piles on. Update: Aaronson says he will continue to be a unabashed doofus and admit when he doesn’t know something or makes a mistake. In this morning’s developments, we have prominent skeptic Michael Shermer, in Much Ado About Nothing, making the case that the Multiverse finishes off that “God” business, using “multiverse hypotheses predicted from mathematics and physics”. If I'd just titled the book "A Marvelous Universe," not as many people would have been attracted to it. So his title is flamebait, but it suckered Dawkins into endorsing the book by saying that it is the "deadliest blow to supernaturalism" since Darwin. I haven’t responded to the review by Albert simply because it seemed to me not worthy of response.. and nothing has changed my mind about that. That question can be phrased as follows: How can a universe full of galaxies and stars, and planets and people, including philosophers, arise naturally from an initial condition in which none of these objects—no particles, no space, and perhaps no time—may have existed? Put more succinctly perhaps: Why is there ‘stuff’, instead of empty space? Why is there space at all? About the only philosopher Krauss credits is Peter Singer, the wacky animal rights guru. I attack philosophers myself on this blog, and in my book. But the NY Times reviewer, David Z. Albert, was a legitimate physicist before he turned to philosophy, and his criticisms are never directly addressed by Krauss. Albert wrote a book on the many-minds interpretation of quantum mechanics, which is pretty goofy, but not directly relevant. The core of the problem is that modern physics has nothing to say about nothingness. There is no such thing, as far as we know. The closest we can get to empty space is the luminiferous aether, also called the quantum vacuum state. Our best quantum theories, such as quantum electrodynamics (QED), are really perturbation theories of the aether. That is, what seems like empty space to us is really a complicated set of fluctuating relativistic quantum fields. A few decades ago, cosmologists proposed that the observable galaxies are the remnants of quantum fluctuations during the first nanosecond of the big bang. Krauss elaborations on this, and says that the whole universe might be the result of quantum fluctuations. As he tacitly admits, he is not really telling us Why There Is Something Rather Than Nothing, but rather giving a modern variant of Turtles all the way down. More profoundly, the novel methods breathe new life into a unified theory that physicists left for dead in the 1980s. The force of gravity looks like two copies of the strong subnuclear interactions working in unison. The tipoff is that the authors keep talking about how radical and revolutionary their approach is, but cannot point to any substantive progress since the 1980s when many experts decided that it was a dead-end. The same issue has a separate article explaining why supersymmetry is dead. While there is some debate about that, supergravity is surely dead and not worthy of a SciAm cover story. Physicists have demonstrated that making a decision about whether or not to entangle two photons can be made after you've already measured the states of the photons." There is more explanation here and here. If they really found an experiment that reverses cause and effect, it would be headline news. Nobel prizes would be given. It would be hailed as the most profound discovery of the last century, if not the last millennium. Like paychic telekinesis, or perpetual motion machines. I don't doubt that they have a clever experiment for confirming some quantum mechanics formula, but quantum mechanics has no way to reverse cause and effect. 2. Determinism. Lou Jost and other readers on this site have argued that behavior (and evolution) might not be deterministic because they’re affected by quantum-mechanical considerations. When I used the word “determinism” in the past, I suppose I was a bit inaccurate: what I meant was that behavior is determined by physical processes, both deterministic and quantum-mechanical, i.e., that there is nothing to our behavior beyond physics. I should have used “materialism” rather than “determinism”! Now I’m not quite convinced that quantum mechanics plays a real role in both our decision-making or in the course of evolution. Can our “choices” really be affected by nondeterministic motions of molecules? And is mutation, a crucial factor in setting the course of evolution, really affected by quantum mechanics? I remain agnostic on these issues and am doing some reading to get up to speed. They are doubting the role of quantum mechanics. There is no understanding of molecular biology without quantum mechanics, and there hasn't been for nearly a century. I don't think it helps his argument to replace the word “determinism” with “materialism”. I guess that he trying to imply that he accepts quantum mechanics but not religion, because common interpretations of quantum mechanics are not deterministic. But they are not materialist either! Physicists even call them "spooky" to emphasize how they are contrary to materialist intuition. Science has told us so much ... But when scientists insist that they have solved, or will soon solve, all mysteries, including the biggest mystery of all, they do a disservice to science; they become the mirror images of the religious fundamentalists they despise. In the comments, Krauss protests that he "didn’t make any definitive claims", as if that excuses him from trying to write a scientific book on a religious subject. The discovery of the Higgs boson would be a gratifying verification of present theory, but it will not point the way to a more comprehensive future theory. We can hope, as was the case with the Bevatron, that the most exciting thing to be discovered at the LHC will be something quite unexpected. Whatever it is, it’s hard to see how it could take us all the way to a final theory, including gravitation. That is his plea to build a new particle accelerator. This is the first article like this that I have seen that does not mention Einstein. There are more comments here. I suspect that Weinberg does not mention Einstein because Einstein is famous for revolutionizing physics while working at a day job. Weinberg wants $100B of funding for a project to find the Einsteinian final theory, but it doesn't help to mention Einstein because people might say that it would be better to wait for some genius like Einstein to solve the theory in his spare time. No amount of money is going to “take us all the way to a final theory”, as Weinberg advocates. As long as he states his goals in terms of these unachievable fantasies, the congressman is right to say “No”. It seems to me that what is really needed is not more special pleading for one or another particular public good, but for all the people who care about these things to unite in restoring higher and more progressive tax rates, especially on investment income. I am not an economist, but I talk to economists, and I gather that dollar for dollar, government spending stimulates the economy more than tax cuts. It is simply a fallacy to say that we cannot afford increased government spending. This is crazy left-wing nonsense. The USA has vastly increased govt spending in the last 3 years, with stimulus bills, bail-outs, war escalations, new social programs, expanded food stamps, and quantitative easing, and the result has been the longest recession that anyone can remember. Government spending does not stimulate the economy. The Great Depression proved that. When Robert Shankland asked Einstein how he had learned of the Michelson-Morley experiment, Einstein told him that he had become aware of it through the writings of Lorentz, but only after 1905 had it come to his attention. "Otherwise", he said, "I would have mentioned it in my paper". He continued to say that the experimental results which had influenced him most were stellar aberration and Fizeau's water tube experiment. "They were enough". Indeed the famous Michelson-Morley experiment is not mentioned in the 1905 relativity paper; but curiously Einstein did not mention Fizeau's experimental result either, and this is puzzling in light of the importance of the experiment in Einstein's pathway to his theory. This contradiction was chiefly eliminated by the pioneering work of H. A. Lorentz in 1895. Lorentz showed that if the aether were taken to be at rest and did not participate at all in the motions of matter, no other hypotheses were necessary to arrive at a theory that did justice to almost all of the phenomena. In particular, Fizeau's experiments were explained, as well as the negative results of the above-mentioned attempts to detect the Earth's motion relative to the ether. Only one experiment seemed incompatible with Lorentz's theory, namely, the interference experiment of Michelson and Morley. It was because of the Michelson–Morley experiment that Lorentz and Poincare improved the 1895 theory to a full relativity theory during 1899-1904, and they said so in their papers before Einstein wrote anything. So Einstein certain knew in 1905 that Michelson-Morley was the crucial experiment for special relativity, but he may not have understood exactly why. In 1907 Max Laue showed that the Fresnel dragging coefficient would follow from a straightforward application of the relativistic addition theorem of velocities. This derivation is mathematically equivalent to Lorentz's derivation of 1895. From 1907 onwards Einstein adopted Laue's derivation. When the Einstein fans praise his 1905 work, they often argue that the previous work of Lorentz and Poincare was just mathematical, while only Einstein truly appreciated the physical significance of relativity. Others say the opposite, and argue that Einstein paid no attention to the physical experiments, and that his contribution was to turn relativity into a mathematical theory with postulates. I think that both views are desperate and misinformed attempts to over-credit Einstein. John Norton writes, "It might seem surprising that Einstein could devise and publish the relativistic rule of velocity composition in his 1905 paper (§5) without recognizing that the result of the Fizeau experiment is a vivid implementation of the rule." ... Stachel explains that Einstein was under the spell that everything could be solved using Maxwell's equations that he failed to notice the kinematic nature of Fresnel’s formula, resulting from direct application of the relativistic law of combination of relative velocities; it was left for Laue to make this observation in 1907. These are all big Einstein idolizers who have looked really hard for originality in Einstein's work. They say that Einstein had a superior understanding of relativistic kinematics, so they are baffled he was unable to apply that understanding to Fizeau, as Laue did. The simple explanation is that Einstein did not have a superior understanding. Weinstein also posts Did Mileva Maric assist Einstein in writing his 1905 path breaking papers? Writers read Einstein's letter to Maric from 1901 in which he wrote: "bringing our work on relative motion to a successful conclusion!" What came afterwards was boosted by a claim that Joffe had seen the original relativity paper manuscript, and that it was signed "Einstein-Marity" (i.e., "Maric"). This drew the attention of some writers to develop a theory according to which Mileva Maric assisted Albert Einstein in solving his physics problems, but her name was left out of the published article and only Einstein's name appears in the journal as author. Historical and primary sources do not support this scenario. 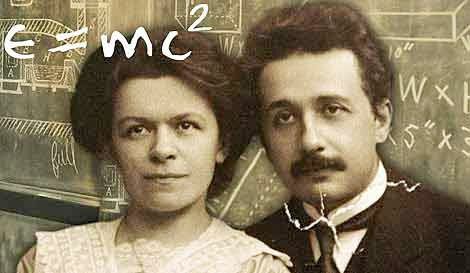 Mileva was a physics grad student, was married to Einstein, and did read and discuss his papers with him. So she surely had some influence. The question is how much. The main argument against Mileva's influence is that she never again did anything so original. But some of Einstein's strongest admirers also say that he never again did anything so original as that 1905 relativity paper. My view is that the 1905 was not very original at all, and that we cannot trust Einstein about his sources because he did not believe in crediting his sources. So the amount of her influence is a mystery, but not a very interesting one. Even if it were somehow shown that she came up with the main ideas, it would not change my opinion of him very much because it would just mean that she stole them from Lorentz and Poincare instead of him stealing them. Non Sequitur by Wiley Miller, April 19,2012. I'm finally getting around to reading the Walter Isaacson biography of Steve Jobs. I'm fascinated by the discussion of how Jobs developed what became known as the Reality Distortion Field. Apparently Jobs had a lifelong battle with reality and won. One way to look at Jobs' life is that he was a liar and a con man with a gift for design. According to Isaacson's reporting, Jobs had no love for truth. Jobs learned how to lie, cajole, manipulate, and charm until people believed whatever he wanted them to believe. By all accounts, Jobs' mixture of cruel and unsavory skills caused people to produce seemingly impossible results. That's one way to interpret events. But it's not the only interpretation. According to Isaacson's book, Jobs spent years trying to understand the nature of reality before he started bending it. Jobs dropped a lot of acid, travelled to India, followed gurus, became a fruitarian, meditated, and studied religion. He was clearly looking for something. What if he found it? Jobs' spiritual journey probably led him to believe reality is subjective - more like a complicated set of ideas than a huge clump of matter. I've never tried acid, but from what I hear, it changes your view of reality forever. Before you take acid, a rock is just a rock. After acid, a rock is sometimes a rock, and other times it's just one possibility. When you consider all of Jobs' spiritual experiences, it's fair to assume he had an open mind about the nature of reality. For context, keep in mind that physicists also have some whacky ideas about the nature of reality. Some scientists believe we are experiencing just one of many universes. Others question the nature of time. Einstein showed us that reality is different for observers traveling at different speeds. And in the quantum world, reality is smeared across probabilities. Isaacson also wrote the biggest-selling of the 500 biographies on Einstein, and likes to compare Jobs to Einstein. I cannot confirm this. I also cannot confirm that Einstein said, "Originality is the art of concealing your sources." He certainly did conceal his sources, but I doubt that he would admit directly how profitable that had been. Lehrer conceals his sources, and never defines creativity. His book is a series of paradoxical anecdotes, couched in pop psychology, and masquerading as profound observations. There seems to be huge demands for books like this. Not as much demand as the demand for female fantasy, but huge demand with pseudo-intellectuals like Charlie Rose. I’ve always been fascinated that, the more you delve into science, the more it appears to rely on faith. What kind of misguided “faith” would lead people to believe in dark matter, of all things? Stewart is a parody of a left-winger. The companion show on the Comedy Channel has Colbert as a parody of a right-winger. They both say stupid things to get laughs. Carroll takes Stewart too seriously. Many are still hopeful. “There are still very viable ways of building supersymmetry models,” Peskin says. Expecting to see new physics after just a year of data taking was unrealistic, says Joseph Lykken, a theorist on the CMS team. Carroll's own research is on time travel, extra dimensions, and the arrow of time. All of this is a matter of faith, and there is no physical evidence for any of it. In other recent blog entries, Carroll argues that Science Refuted Religion. And in Quantum Mechanics and Decision Theory, Carroll argues for many-world theory, where there are infinitely many parallel universes with people just like us. He argues that quantum probabilities are just an illusion that follows from trying to decide what universe to join. Lumo refutes him. I have argued that probabilities are not essential to quantum mechanics, but I have to admit that certain experiments look probabilistic. The many-worlds theory cannot explain the probabilities because the advocates claim that all possibilities occur in different universes. Real science does not require faith, but Carroll's science does. So I can understand why Stewart would say that advanced science requires faith, when high-profile physicists like Carroll are always promoting ideas that can never be verified. In the crucial years there is a major problem still basically unsolved. The host of evidence and sporadic pieces of primary material do not shed too much light on the course of Einstein's complete way of thinking between 1902 and 1905. Scholars manage to create stories of Einstein's pathway to relativity. It is not that complicated. Einstein's patent job allowed him to spend his time in the library reading papers by Lorentz, Poincare, and others. Einstein lied all his life about his pathway to special relativity, and had trouble keeping his story straight. His fanboi biography have tried to find explanations that credit him for original work, but none of them are plausible. Max Born recalled in 1955 that, "in spring 1915" he was "called to Berlin by Planck, to assist him in teaching. […] I was near Planck and Einstein. It was the only period when I saw Einstein very frequently, at times almost daily, and when I could watch the working of his mind and learn his ideas on physics and on many other subjects. […] When speaking of the physical facts which Einstein used in 1905 for his special relativity I said that it was the law of electromagnetic induction which seemed to have guided Einstein more than even Michelson's experiment. Now the induction law was at that time about 70 years old – Faraday discovered it in 1834 – everybody had known all along that the effect depended only on relative motion, but nobody had taken offence at the theory not accounting for this circumstance". Born is particularly dishonest here. Lorentz and Poincare had taken offense, and constructed a theory to account for year, years before Einstein. Some of that work got a Nobel Prize in 1902. Maxwell took offense many years earlier in 1861, as noted in Weinstein's footnote 43, and that was the reason that Michelson did that first experiment in 1881. The striking point is that [Einstein’s 1905 paper On the Electrodynamics of Moving Bodies] contains not a single reference to previous literature. It gives you the impression of quite a new venture. But that is, of course, as I have tried to explain, not true. Whittaker, the old mathematician, who lives here as Professor Emeritus and is a good friend of mine, has written a new edition of his old book History of the Theory of the Ether, of which the second volume has already been published. Among other things it contains a history of the theory of relativity which is peculiar in that Lorentz and Poincare are credited with its discovery while your papers are treated as less important. Although the book originated in Edinburgh, I am not really afraid you will think that I could be behind it. As a matter of fact I have done everything I could during the last three years to dissuade Whittaker from carrying out his plan, which he had already cherished for a long time and loved to talk about. I re-read the originals of some of the old papers, particularly some rather off-beat ones by Poincare, and have given Whittaker translations of German papers (for example, I translated many pages of Pauli's Encyclopaedia article into English … in order to make it easier for Whittaker to form an opinion). But all in vain. He insisted that everything of importance had already been said by Poincare, and that Lorentz quite plainly had the physical interpretation. So Born was doing his best to promote his buddy Einstein, but he cannot keep his story straight either, and his writings have several contradictions on this point. 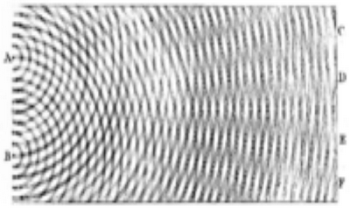 Weinstein shows that Einstein's 1905 comments about the magnetic induction example (that Born claimed were so original) were nearly identical to text in an 1894 Foeppl electromagnetism textbook that Einstein almost certainly used. But Einstein never mentioned Foeppl or the book. The Einstein fanbois sure put a lot of effort into making sense out of his self-serving lies. On July 16, 1955, at the International Relativity Conference in Bern, Max Born delivered a lecture, "Physics and Relativity", "Physik und Relativität", and spoke about Poincaré's influence on Einstein, "Carl Seelig, who had published a very attractive book 'Einstein in Switzerland', wrote Einstein and asked him which scientific literature had contributed most to his ideas on relativity during his period in Bern ..."
Seelig heard about the work of the mathematician Edmund Whittaker, "History of the Theories of Aether and Electricity 1900-1926", and of the chapter "Relativity of Poincaré and Lorentz". In this chapter, writes Seelig, Whittaker makes the curious claim that Poincaré and Lorentz are the actual founders of the theory of relativity. For Whittaker, says Seelig, the problem seems to be mathematical rather than physical-philosophical. Seelig requested from Einstein an answer to the question: Whether, as Whittaker claims, before 1905 during Einstein's time in Bern, Poincaré in particular had a decisive impact on him. Seelig also asked Einstein whether he remembered that he worked on Lorentz before 1905. Seelig told the aging Einstein that, in the next congress such questions would be raised. However, Einstein did not live long enough to participate in this conference and answer these questions. Yes, of course Poincare had a decisive influence on Einstein. Einstein always refused to admit it, and so did Born and other idolizers. Joseph Levy of France has just posted Is the aether entrained by the motion of celestial bodies? What do the experiments tell us?. He revisits the issue of whether the Michelson–Morley experiment rules out luminiferous aether drift from the motion of the Earth. This approach appeared quite revolutionary in 1905, since it called into question the ideas developed by a number of classical physicists such as Hooke, Lavoisier, Young, Huygens, Laplace, Fresnel, and Lorentz among others. It is not my intention to ... express assumptions about the nature of the aether. In fact, despite its properties that seem so different from ordinary matter, a number of arguments speak in favour of a substratum  and these arguments have multiplied in the early twentieth century with the development of quantum mechanics. It is difficult, indeed, to accept that a “vacuum”, endowed with physical properties such as permittivity and permeability may be empty. The ability of such an empty vacuum to transmit electromagnetic waves is also doubtful. 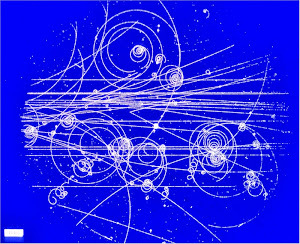 Quantum mechanics, on its part, regards the vacuum as an ocean of pairs of fluctuating virtual particles-antiparticles of very small life-time, a ppearing and disappearing spontaneously, which can be interpreted as a gushing of the aether, although the aether is not officially recognized by quantum mechanics. The interaction of the electrons and the vacuum, in particular, is regarded as the cause of the shifting of the alpha ray of the hydrogen atom spectrum, referred to as lamb shift . The fluctuations of the vacuum are also assumed to expl ain the Casimir effect , and the Davies Fulling, Unruh, effect . A proof of the undeniable existence of the aether was given in ref . Thus, the question to be answered today is not to verify its existence, but rather to specify its nature and its properties, and, in the first place, to determine if it is entrained (or not) by the translational motion of celestial bodies due to gravitation. You will be reassured to learn that the conclusions of Lorentz and Poincare about relativity in 1900 are still good today, and evidence is against the aether drag hypothesis. Science is the human activity of seeking natural explanations for what we observe in the world around us. Science is a human activity of systematically seeking natural explanations for what we observe in the world around us. Throughout history people from many cultures have used the methods of science to contribute to scientific knowledge and technological innovations, making science a worldwide enterprise. Scientists test explanations against the natural world, logically integrating observations and tested hypotheses with accepted explanations to gradually build more reliable and accurate understandings of nature. Scientific explanations must be testable and repeatable, and findings must be confirmed through additional observation and experimentation. As it is practiced in the late 20th and early 21st century, science is restricted to explaining only the natural world, using only natural cause. This is because science currently has no tools to test explanations using non-natural (such as supernatural) causes. Science is not about what's true, or what might be true. Science is about what people with originally diverse viewpoints can be forced to believe by the weight of public evidence. (p. 181) Though we cannot logically prove anything about the physical world, we are entitled to have confidence in certain beliefs about it. The application of reason and observation to discover tentative generalizations about the world is what we call science. The progress of science with its dazzling success at explaining and manipulating the world, shows that knowledge of the universe is possible, albeit always probabilistic and subject to revision. Science is thus a paradigm for how we ought to gain knowledge — not the particular methods or institutions of science but its value system, namely to seek to explain the world, to evaluate candidate explanations objectively, and to be cognizant of the tentativeness and uncertainty of our understanding at any time. Of these, I like the 2005 Kansas definition the best, even tho it was widely attacked by the AAAS (the world's largest science society) and others. I like it because of the emphasis on observing and testing, and not beliefs, prejudices, paradigms, and supernatural distinctions. Einstein biographer (and idolizer) Walter Isaacson wrote a 2009 Atlantic Monthly magazine article on How Einstein Divided America's Jews. He makes it clear that being a Jew was extremely important to Einstein, and how he was politically dedicated to the Zionist cause. I think of Judaism as a religion, but Einstein was not religious in the way that Christians use the word. He did not believe in a personal God, or attend religious services, or pray, or have faith in a spiritual world. To him, being a Jew meant that he was born a Jew and that he was a believer in Jewish identity politics. 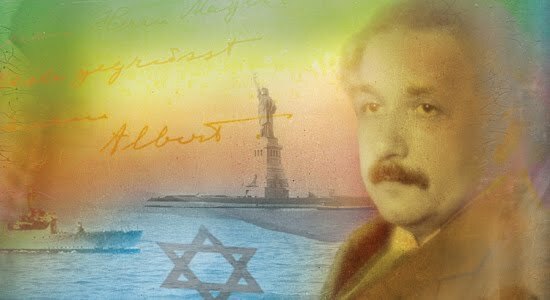 There is often controversy on the Albert Einstein Wikipedia article about whether to prominently identify him as a Jew. Some argue that Judaism is a religion and Einstein was not religious, or that Einstein is famous for his physics and that his Jewishness is only of interest to prejudiced people. However it seems obvious that Einstein's Jewishness is essential to any biography. His Jewishness was extremely important to him, even more important than being German or being a naturalized American. He is mainly famous for being a physicist, but he is also frequently quoted for his opinions on God, religion, and peace. He was an active Zionist and a Nazi refugee. People are fascinated with the details of Einstein's life, and his Jewishness is one of the first things they learn. A reader supplies Einstein's 1921 interview/essay on How I Became a Zionist. Still, Benedict worried in his homily: "The darkness that poses a real threat to mankind, after all, is the fact that he can see and investigate tangible material things, but cannot see where the world is going or whence it comes, where our own life is going, what is good and what is evil." This sounds like dark matter! Or maybe the undetectability of motion thru the aether. The service began dramatically. Except for the twinkle of camera flashes, the basilica was almost pitch-black as the thousands of faithful in pews awaited Benedict's arrival through the rear entrance. ... "Today we can illuminate our cities so brightly that the stars in the sky are no longer visible," he said. "Is this not an image of the problems caused by our version of enlightenment?" He is complaining about light pollution. He should be happy that the Arizona governor vetoed the billboard bill. The Vatican does have a long history of supporting astronomy. Happy Easter. Whether these analogies make any sense or not. A review of my book about Albert Einstein on another web site has provoked discussion of some Jewish issues. See here and here. In the process, I discovered some other sites interested in these issues. Christopher Jon Bjerknes wrote a 2002 book, Albert Einstein: The Incorrigible Plagiarist. You can also find all of his material free. It has some over-the-top Einstein attacks, and some arguments that I found unpersuasive. But the book largely consists of (accurate) quotes from original sources, and you can decide for yourself whether Einstein was a plagiarist. It is a useful resource on Einstein. Die Klärung des Zeitproblemes war schon mehrere Jahre vor dem Erscheinen von Einsteins grundlegender Arbeit (1905) durch H. Poincaré weitgehend vorbereitet worden. H. Poincaré had already completely solved the problem of time several years before the appearance of Einstein's first work (1905). The word "completely" should be "mostly". Professor John Stachel is an Einstein idolizer and editor, and wrote the leading review of the book, and trashed it. But his actual specific criticisms are fairly trivial, and Bjerknes responds with much more serious criticism of Stachel. Because we failed to disarm 15 million Jews in the 20th Century, the Jews genocided 100 million human beings. On the scales of justice, life would have been more balanced had Jewry disappeared. ... It is time for total war on the Jews. Let America be the first nation to declare this war on behalf of the entire human race. This is crazy stuff. He hasn't posted anything in over a year. Here’s another reason why Bjerknes can’t claim ignorance. On page 1044, Bjerknes says the jew-created myth that jews were made into soap during the Holohoax “is today known to have been a myth”. Yet, in the same sentence, he mentions “gas chambers and blood-poisoning stations” as if these are true. Thus, I must think that Bjerknes chose to be in favor of the jew Holocaust story. He chose to try to prop up that monumental, crumbling lie. He chose to do that just as all the major media continue even now to try to prop up that monumental, crumbling lie. Knowing that Bjerknes is flat wrong on the Holocaust, we can approach his claims about Hitler with proper skepticism. I want to be clear that I do not endorse any of this nonsense. I would rather stick to the science. I also wonder why Einstein's reputation is so far in excess of him accomplishments, and there is no scientific answer to that question. Some people liked him because he was Jewish, and some people disliked him for it. I didn't know Einstein said that. I thought that it was considered anti-semitic to say stuff like that. Again, I don't know what to make of this. My book sticks to the physics. An Amazon review gives my book a low rating because "General Relativity ... sprang full-blown from the mind of Albert Einstein", and "curved, multidimensional space ... underlies much of modern technology, including GPS satellites." He points to this site to show that GPS satellites use relativistic time corrections. I wish that were true, but it is not. GPS uses some relativity formulas to correct its clocks based on velocity and gravity, but does not require anything about curved spacetime. No other technology does either, as far as I know, except for experiments designed to test general relativity. Yes, general relativity is a theory that models all gravity with curved spacetime. So if I drop an apple to the ground, then its fall can be explained by curved spacetime. So in that sense, everything using gravity is also using curved spacetime. But you do not need general relativity or curved spacetime to predict when that apple hits the ground, and you do not need it for apples, cars, GPS, or other technologies. It is a historical fact that the formulas for the relativistic time corrections needed for GPS were discovered without any use of curved spacetime. The velocity clock corrections were published by Lorentz (1904), Poincare (1905), and Einstein (1905). Einstein says that he discovered the gravity correction in 1907 with the happiest thought of his life, and published it in 1908. It is a simple application of special relativity. Neither Einstein nor anyone else had said anything about curved spacetime by 1908. Yes, you could say that the GPS formulas could be re-derived using curved spacetime. You can also re-derive them using string theory. But it is a mistake to say that curved spacetime or string theory underlies much of modern technology. Explaining gravity with curved spacetime was not a wholly original idea of Einstein's either. As far as I can determine, it was Marcel Grossmann's idea. Grossmann proposed it in 1913, but Einstein refused to believe that it could really be a geometric spacetime curvature until Levi-Civita and Hilbert convinced him a couple of years later. A reader comments that Einstein could have had some "imaginative leap" that allowed a better interpretation of the aether. Since ..., we have the proof that, on the basis of our kinematical principles, the electrodynamic foundation of Lorentz's theory of the electrodynamics of moving bodies is in agreement with the principle of relativity. The first sentence does not mention Lorentz's name, but Einstein always explained it as referring to Lorentz's 1895 paper. As you can see, Einstein agrees with Lorentz on all points. The 1905 paper has two postulates, the relativity principle and the constant speed of light. The first is explicitly taken from Lorentz, as quoted above. The second was also borrowed from Lorentz, as Einstein later explained. In what follows it is endeavored to present an integrated survey of the investigations which have arisen to date from combining the theory of H.A. Lorentz with the theory of relativity. Einstein always denied that he had read that 1904 Lorentz paper before 1905, in spite of the similarity of ideas, and of evidence that he had access to Lorentz's results. But regardless, Einstein acknowledges Lorentz's 1904 paper in 1907, and acknowledges the similarity with his own work. Einstein does not express any disagreement with Lorentz. Einstein does not express any disagreement with Poincare either, as Poincare had also published a version of relativity theory. Lorentz published his 1906 Columbia U. lectures on relativity, where he described Einstein's work without expressing any disagreement with it. That is where Lorentz says, "Einstein simply postulates what we have deduced". After praising Einstein's simplicity, he says, "Yet, I think, something may also be claimed in favor of the form in which I have presented the theory." Lorentz was saying that he and Einstein had different ways of presenting the same theory, with advantages and disadvantages to each approach. This hypothesis sounds rather fantastical. For the contraction is not to be thought of as a consequence of resistances in the ether, but purely as a gift from above, as a condition accompanying the state of motion. That's right. Lorentz and Einstein had the formulas that are equivalent to special relativity, but it was Poincare and Minkowski who formulated the geometric interpretation that altered the concept of space. It would no doubt seem strange that in a monument raised to the glory of Lorentz I would review the considerations which I presented previously as an objection to his theory. I could say that the pages which follow are rather in the nature of an attenuation rather than a magnification of that objection. The importance of the question determined me to take it up again; the results which I obtained are in agreement with those of Lorentz on all important points; I was only led to modify and supplement them in some points of detail; one will further see the differences which are of secondary importance. Einstein fans like to say that he somehow reversed some faulty view of Lorentz and/or Poincare, but they are never able to explain why Einstein himself was never able to articulate such an opinion. Was he too stupid to realize what he had done? Was he too cowardly to say that someone else was wrong? Were his communication skill insufficient to say what he wanted to say? No, it is much more likely that he simply had no disagreement with Lorentz or Poincare. He did not even understand Poincare.